Lately, we’ve been collating and selecting images for a coming title calledÂ Ritual America: Secret Brotherhoods and Their Influence on American Society, a Visual Guide. This book has strangely become an unexpected lesson in the sado-masochistic rituals practiced in Masonic and other fraternal initiation ceremonies. Several factories manufactured the paraphernalia involved to threaten and humiliate new indoctrinees; apparently electrically-charged fake goats, handcuffs, blindfolds and horrifying guillotine replicas were in great demand across the country at fraternal lodges. So I guess you could say that sado-masochistic scenarios were very much a part of middle America. And so they were in a number of prime time television shows and B-movies. My father, the character actor Woodrow Parfrey, appeared in the second-rate dramedyÂ Sam Whisky, a scene from which is pictured above.Â Dad filled a decent niche playing goofballs, creeps, losers, and orangutans as well. I guess you could say that he was flexible. Woody (as he was called on the set), or Biff (as friends said) came back from the set one evening. I’ve never heard him as enthusiastic as he was about a co-star. Little eight year old me was perplexed to hear him go on about “the very lovely Angie Dickinson,” and in the photo above one can see why. 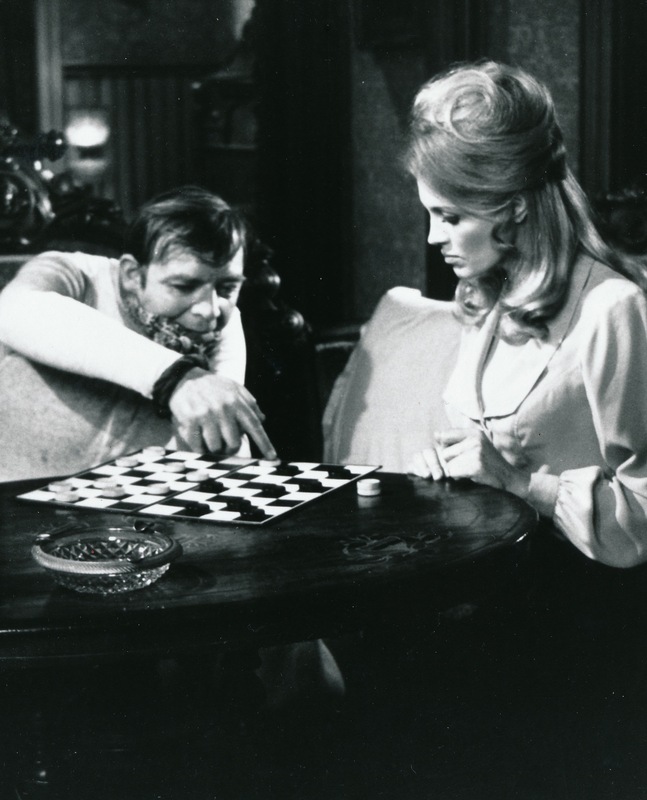 Perhaps she dug his checkers-playing style. A few years earlier he played a crazy barbed-wire salesman in an episode ofÂ Have Gun, Will Travel called “Bob Wire.” The show’s big joke is that the super-hot Irish McCalla (ofÂ Sheena, Queen of the Jungle) falls in love with nerdy big mouth Bob Wire. Joe Coleman’s favorite Woody Parfrey performances were his milquetoast serial killer character in the “Burst of Passion” episode ofÂ Naked City, and his appearance as a lovable but dysfunctional retard on a strange Christian series calledÂ Insight. Joe painted Woody in his oversize masterpiece about the television shows and performers that most affected him. Good old Woody, I miss him.